Kielbasa might seem a bit ordinary after our New Year's Eve geoduck, but I was looking forward to my New Year's Day kielbasa just as much. 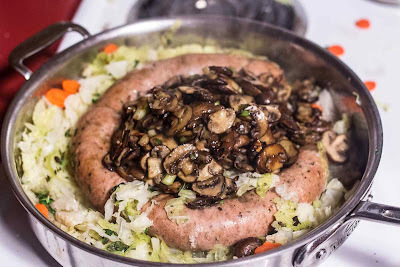 The pork-and-cabbage route, along with being traditional, was getting a bit more exciting this year as I would be trying to make my own traditional Polish kielbasa. I had tried making something like kielbasa a few years ago, but it was mostly a coarse ground sausage with some Eastern European spices. Not true, authentic kielbasa like this year; now I had the knowledge! For Christmas Matt gave me a copy of Polish Sausages: Authentic Recipes and Instructions by Marianski, Marianski, and Gerbarowski. I have their Home Production of Quality Meats and Sausages, also from Matt, and also an amazing book. The premise of this book is insane, but totally true. In 1945 the Polish government looked to organize and regulate the quality and ingredients of meat products. This was a huge undertaking that involved the top professionals in meat science in Poland. The first copy of the book was released in 1959. This standardized the recipes, graded meat quality, and worked with trade associations and guilds to produce top-quality and consistent products. But in 2004 when Poland joined the European Common Market, they had to conform to the broader (and less stringent) regulations of the EU. 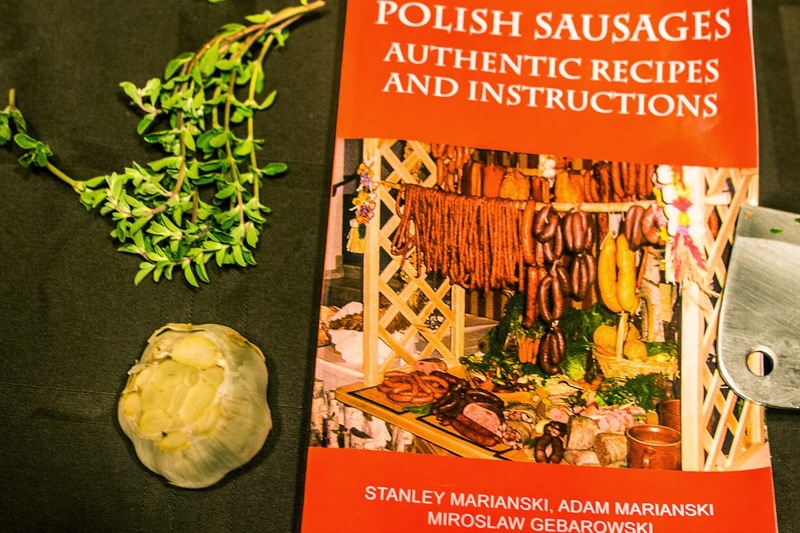 This made the sausages deteriorate in quality, as lower grades of meat, more chemical preservatives, and larger amounts of cereal adjuncts and water found their way into Polish meats. This was true in many other countries as well. Germany never permitted the use of liquid smoke in their products, but when they joined the Common Market, this restriction was removed to allow free trade of other products from countries that did allow the use of liquid smoke. So this book works off those standardized recipes - listing the original government recipes (in 100 kilogram batches) along with smaller scaled-for-home sized batches next to them. What surprised me about the authentic Polish kielbasa (kielbasa wedzona) was the short list of ingredients. I assumed kielbasa included mustard seed, caraway, and possibly some juniper or rosemary. But the spices were simple: black pepper, fresh marjoram, and garlic. The smooth texture of kielbasa is usually achieved by making an emulsified sausage, but I wanted to try something I saw at Underground Meats. To make an emulsified sausage (in their case, nduja), they ran the meat through a bore grinder 4-5 times, chilling the meat near freezing between each grind to keep the meat and fat in suspension, to get a smooth, even texture. Although it took longer (mostly waiting for the meat to get nearly frozen before regrinding), this technique worked really well. I used progressively smaller grinder plates, making the meat finer and finer each time. Then I poached the sausages to 155F to seal the suspension. Polish Sausage has a range of recipes, some involve just smoking, or just poaching, but I wanted to get that characteristic smokey kielbasa flavor. 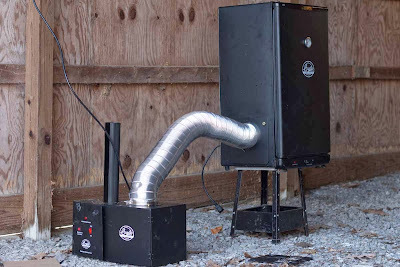 Thankfully, Matt's gift was a dual one, as he also gave me a cold smoker attachment for the Bradley smoker. It was amazing! The smoker hot box is separated from the meat chamber by a length of metal tubing, allowing the heat to dissipate and simply bath the meat in waves of cool oak wood smoke. The temperature never rose above 35 F (the outside ambient temp), so there was no risk of the sausage overcooking during the 8 hour smoke time. This was the first time I used it, but I think I'm going to have a lot of fun with this rig. When it came to the eating, I was not disappointed. 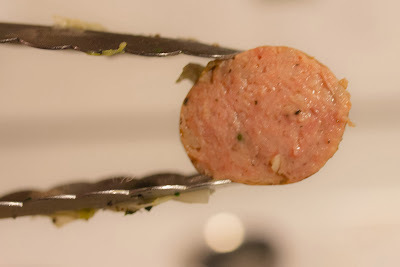 The kielbasa was smokey, savory, garlicky, and just had a hint of the marjoram. 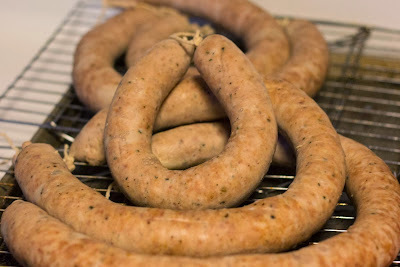 Plus, as you can see from the photos, my grinding work produced a pretty even and smooth emulsion in the sausage's texture. 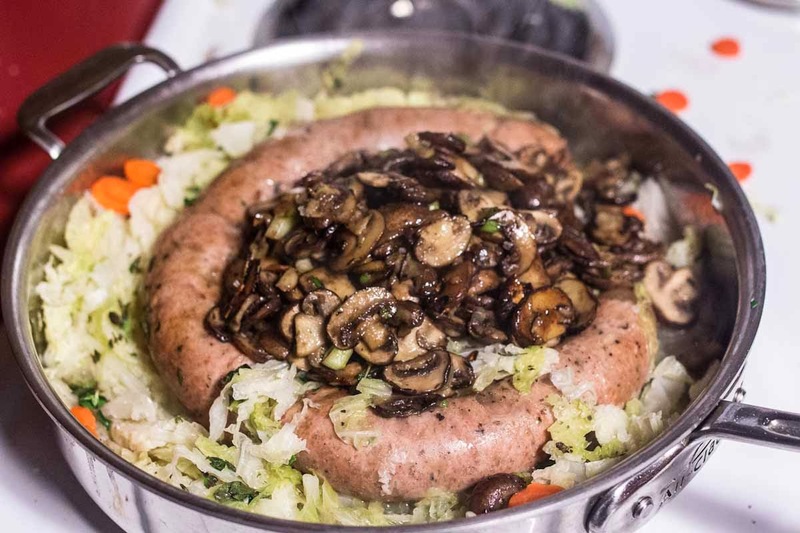 With some cabbage, mushrooms, and a bit of mustard, I was ready to take on the new year! When can I have lunch at your house?